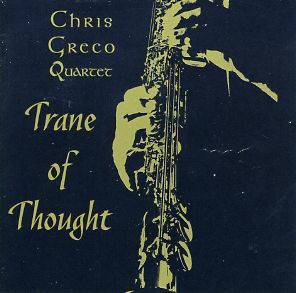 Why does an album as good as Trane of Thought (GWS FourWinds 71959), recorded in 1994, take so long to come out? Whatever the reasons, they aren't about the musical quality. To the credit of composer-saxophonist Chris Greco, he's been very prolific, creating compositions that are getting attention, and like all of us he has to raise money to eat as priority no. 1. And in the end it doesn't matter, as long as the music is here now. This is a grouping of eight Greco compositions plus Mal Waldron's classic "Soul Eyes," played by a together quartet of Greco on reeds, electric guitarist Brad Rabuchin, Dean Taba on acoustic bass, and Kendall Kay on drums and conga. The music has a post-Trane torque (though Greco doesn't sound like Trane exactly, more himself) but with the changed texture that the substitution of guitar for piano can bring. Rabuchin comps nicely and can solo well too and Greco has a very creative solo approach. The rhythm section swings and burns with a quiet but busy fire. And the pieces have genuine substance. I am sorry I missed this Greco conflagration back then, but very glad to catch up with them now. This is a real sleeper!